Calling all carnivores! Please join us in indulging in Korean BBQ as we share our list of favourites with you. We know so many of you have professed your love for Korean BBQ, and yes, we love a good meat feast too. Or a smokey affair at that. You know, that satisfaction when a whole galore of meat unfolds before you, and you just eat like there is no tomorrow. Of course, to neutralize the sin, we eat more kimchi to aid digestion, and we order stews to share. But hey, life is too short to waste your calories on lousy food. We say just go all out on Korean BBQ, and party with all those damn meats! Here is our take on Singapore’s Best Korean BBQ Restaurants. You are welcome. Long queues are formed outside the Tanjong Pagar outlet daily during dinner hours. 2D1N Soju Bang Korean Restaurant may be a small outlet, but its menu sure excites. Other than the ubiquitous Beef Short Ribs (S$22 per 200g) and Pork Belly (S$18 per 200g), 2D1N has very interesting items such as Spicy Ox Tail Stew (S$40), Stir-fried Squid with Kimchi and Pork Belly (S$30) and Spicy Fish Stew (S$35). 8 Korean BBQ is a modern Korean BBQ restaurant that is famous for its 8 Colours Set (S$98) which features Mangalitza pork belly in 8 flavours – wine, original, ginseng, garlic, herb, curry, miso paste, red pepper paste. In addition to the pork belly, 8 Korean BBQ also serves USDA Prime (S$38 to S$58) and Kagoshima Wagyu (S$78 to S$110). You should also get a Korean Stew to go along with the BBQ meat. Options include Beef Kimchi Stew (S$18), Seafood Soft Tofu Stew (S$24), but we highly recommend the Army Stew (S$24). Located on the ground floor of Link Hotel at Tiong Bahru is Blue Garden, and the bulgogi here is crazily delicious. It was our favourite among all the meats, but that said, Blue Garden still has a pretty wide spread to offer. The side dishes were pretty run-out-of-the-mill, so we’d suggest to skip that and save your tummy space for meat. And more meat. This is a slightly pricier option, but trust us – quality comes with a price and it is worth paying for prime meat. Bornga sits on the second level of Vivo City, and if you are lucky enough to get the seats by the side, you’ll enjoy dinner with a view of Sentosa. Over on the menu, the BBQ meat selection ranges from S$22 to S$45. We loved the Kimchi Jjigae (S$15) and Bibimbap (S$15). And what we really like about Bornga is the experience – they serve you a whole selection of veggies and chillies, as with premium salt and sauces to complement your BBQ meats. Opened by the folks behind Ministry of Food, you can expect Daessiksin to be an affordable joint for casual dining. 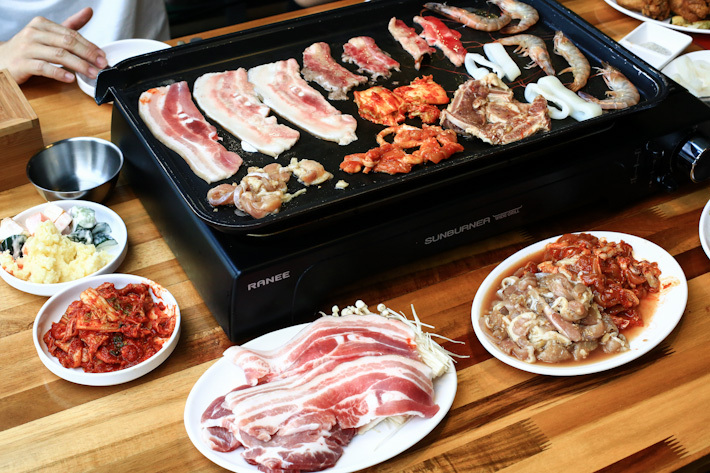 The Korean BBQ buffet includes beef short ribs, beef short plate, beef ribeye, beef bulgogi, pork belly, pork collar, pork marinated ribs, and chicken bulgogi, an assortment of side dishes as well as free flow of drinks. 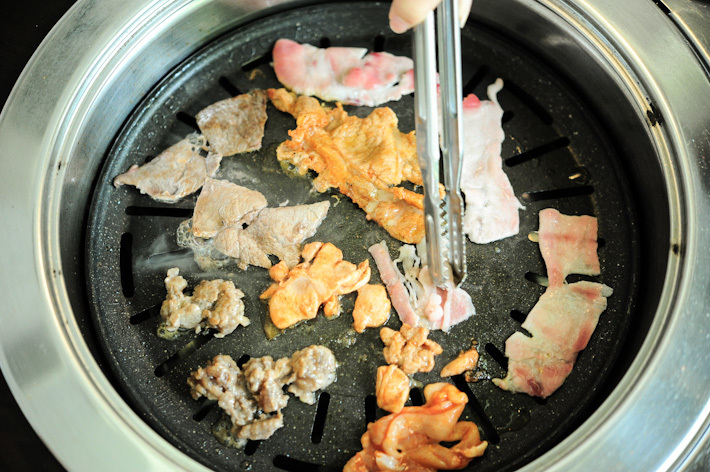 K. Cook Korean BBQ Buffet at Orchard Central is one of the most affordable Korean BBQ buffet restaurants in Singapore. 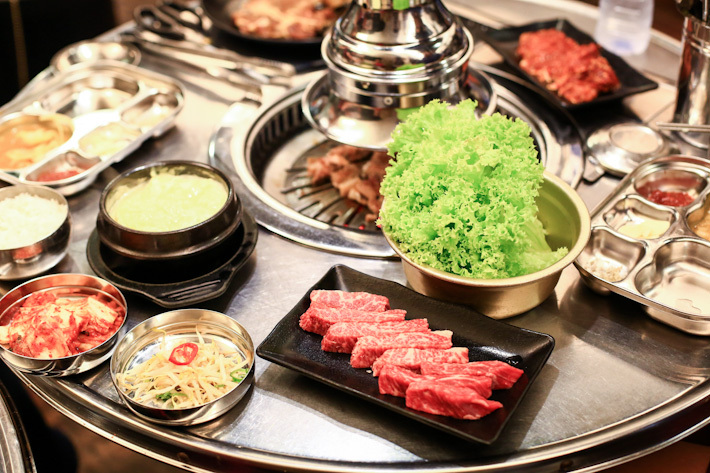 On weekdays, the Korean BBQ buffet is S$14.90++ /pax for lunch, and S$24.90++/pax for dinner. If you like Korean BBQ buffet and do not mind paying slightly more, then Han Geun Doo Geun Korean BBQ Buffet Restaurant, an under-the-radar outlet at Chinatown Point, is for you. Well, they may not have the cheapest buffet prices (S$26.90++ for lunch, S$36.90++ for dinner) in town, but hold your horses and do not just strike them off your list yet. Let us tell you why. Not only does Han Geun Doo Geun serve a selection of decent meats, it also has a buffet station with 12 to 14 banchan (side dishes) that you can stuff yourself silly with. AND, ala carte servings of noodles, bibimbap, topokki, and Korean soups and stews. More known for their weekday Korean BBQ lunch buffets, Ssikkek Korean Grill – owned by the guys behind 2D1N Soju Bang – offers a value-for-money dining experience. At S$14.90++ per adult, expect a variety of beef, pork, and chicken meats alongside vegetables, and side dishes like kimchi pancake, sweet potatoes and salad. One of the most popular Korean BBQ restaurants in Singapore, Super Star K specialises in using charcoal grill for its Korean BBQ, and the authentic dining experience explains its popularity among Singaporeans and tourists alike. Perpetually packed and crowded, dinner might have to come with a little wait, but we will tell you it is going to be worth the while. We ordered a variety of dishes like Sliced Pork BBQ (S$18), Pork Belly BBQ (S$18), Spicy Chicken BBQ (S$18), Black Pepper Chicken (S$18), Pork Bulgogi (S$18), Seafood Pancake (S$25) and Soy Bean Paste Stew (S$12). Everything was great, and there was nothing much to pick on. The quality of the meat wasn’t anything to get excited about, but they were well-marinated and the servers are all dedicated to BBQ-ing them for you. What makes Wang Dae Bak stand out from most of the Korean BBQ restaurants in Singapore is its use of charcoal to grill the meat. Besides the usual Pork Belly (S$18) and Spicy Marinated Chicken (S$18), Wang Dae Bak also offers other meat selection including Beef Tongue (S$28), Boneless Prime Rib (S$28) and Herb Wine Pork Belly (S$20). The menu is not just restricted to Korean BBQ meat. You can also find the classic Korean dishes such as Kimchi Pancake (S$18), Seafood Bean Paste Soup (S$15), and Spicy Rice Cake (S$6). And if you are a fan of Korean BBQ, it is safe to guess that you love Seoul too, yes? It is a co-relation that cannot be denied, somehow, somewhat. Well, even if you do not, we will tell you what you are missing out on. You need to take a holiday to Seoul, and here are 10 Things To Do in Seoul; you are so gonna have fun, you know it. Hey.. U should tru regent hotel seoul resturant. Is awesome thou is slightly ex but meat are fresh and the sides are good too..
#1 is a definitely a paid advertisement . Service was totally sucky. Walked in with my wife and baby, no staff served me. Saw a lady, which looked like the boss, she sat down and pointed me to the table. Didn’t even bother to stand up and serve us. After deciding what we wanted to eat, I looked around for any available staffs to order, but none to be found.. Had to Walked up to the counter and place my order, but told me to sit down someone will serve me soon. Okay fine..someone came up to us, so we asked a few basic questions like ‘what are the best dishes to recommend ?’ Staffs can’t even answer the question with confidence.. Okay fine…dish arrives, food quality and taste was way below standard..we order Korean ramen, it tastes like the instant noodles I have at home. The meat wasn’t tender and juicy. Service 0/10 ; food 1/10 . DO NOT WASTE YOUR MONEY TO GO THERE! Go at your own risk. Try One Two Kitchen on Kim Tian Road near Tiong Bahru Plaza. It’s the new Korean restaurant next to Big mama and their fried chicken and spicy sauced BBQ are quite nice. Didn’t expect much but had a great surprise I could eat Korean BBQ in the neighborhood.. No need to travel all the way to Tanjong Pagar for Korean food anymore..they need to improve on some of staff’s service but overall it was pretty fine experience with only $10 can eat Korean BBQ. Definitely value for money! Just the location is a little hidden though..